- rural development and (un)limited resources -Belgrade Chamber of Commerce, 05-06th June 2014. In period 05-06th June 2014, at the premises of Belgrade Chamber of Commerce, Institute of Agricultural Economics Belgrade has organized traditional International scientific conference named "Sustainable agriculture and rural development in terms of the Republic of Serbia strategic goals realization within the Danube region" - rural development and (un)limited resources. Conference represents results on project III 46006 "Sustainable agriculture and rural development in terms of the Republic of Serbia strategic goals realization within the Danube region", project period 2011-2014., which is funded by Ministry of Education, Science and Technical Development of Republic of Serbia. 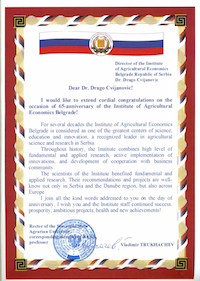 Conference has organized Institute of Agricultural Economics Belgrade in cooperation with 34 eminent institutions from Serbia, Bosnia and Herzegovina, Montenegro, Macedonia, Greece, Russia, Romania, Germany, Poland, Austria, United States of America, under the patronage of Ministry of Education, Science and Technical Development of Republic of Serbia. With the presence of large number of guests from country and abroad, scientific conference has open prof. Zoran Rajić, State Secretary of Ministry of Agriculture and Environmental Protection of Republic of Serbia. Attendees were addressed by prof. Ivica Radović, Assistant Minister of Education, Science and Technological Development of Republic of Serbia and PhD Milan Janković, president of the Belgrade Chamber of Commerce. 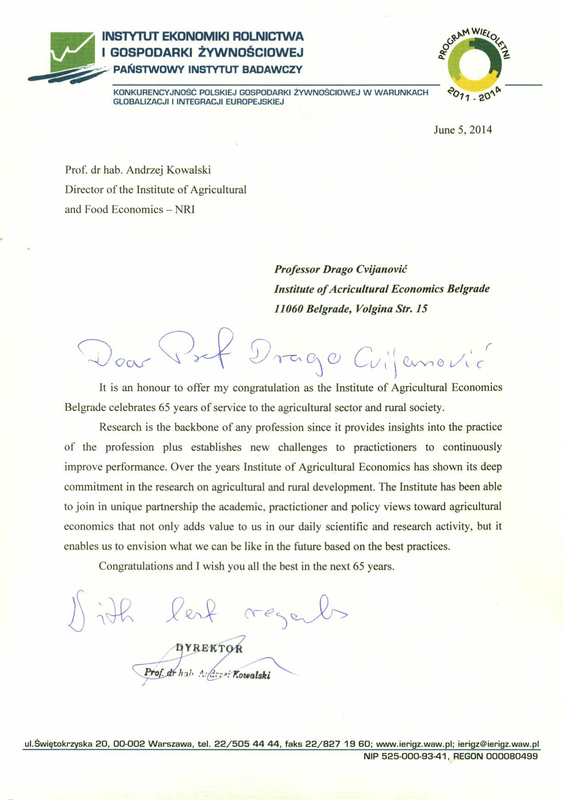 In occasion of 65th anniversary of the establishing of Institute of Agricultural Economics Belgrade, all attended were welcomed by prof. Drago Cvijanović, Director of IAE, with appropriate presentation about established results in previous 5 and 65 years of existence and working of Institute. 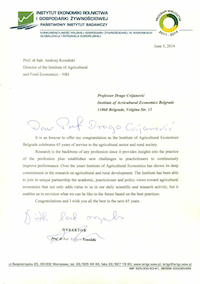 As a sign of gratitude for scientific and any other contribution to the work and progress of our Institutions Special thanks were given to the following colleagues: PhD Milan Janković, president of Belgrade Chamber of Commerce; PhD Andrei Jean, University of Petroleum and Gas, Ploiesti, Romania; prof. Vladimir Trukhachev, Rector of Stavropol State Agrarian University, Russia; prof. Andrzey Kowalski, Director of Institute of Agricultural Economics and Food, Warsaw, Poland; prof. Dragić Živković, Faculty of Agriculture Belgrade-Zemun, Serbia; prof. Zoran Nјegovan, Faculty of Agriculture Novi Sad, Serbia; PhD Danica Mićanović; Secretary of the Committee for technological innovations of the Serbian Chamber of Commerce; prof. Zorica Vasiljević, Faculty of Agriculture Belgrade-Zemun, Serbia. 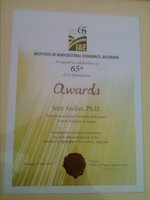 Within the plenary sessions, their works are presented in the name of prof. Dr. Andrzej Kowalski work was presented by Dr Adam Wasilewski, Institute of Agricultural Economics and Food, Warsaw, Poland. Their plenary papers also have presented: Ana Grigorievna Ivolga, State Agricultural University in Stavropol, Russia; Vojislav Stanković, Serbian Chamber of Commerce, Serbia; prof. William Meyers, Research Institute for Food and Agricultural Policy, University of Missouri, Columbia - United States. Following the Conference, in the three sections have been presented 63 works, signed by 123 authors and co-authors. The works are unified new knowledge in the field of rural economy and integrated local development; allocation and valorisation of resource potentials as well as the reform of the Common Agricultural Policy after 2013. On the second day of the scientific conference, was presented the new edition of the monograph of the Institute of Agricultural Economics. It was organized round table titled "What after the flood? ", which has attracted much attention of those present and initiated an interesting discussion. It was agreed that the conclusions of the round table together with the conclusions set delivery line Ministries, Chambers of Commerce and the media. On the same day, the following was held a regular basis (optional) session of the Balkans Scientific Association of Agricultural Economists (BSAAE), where the elected leadership. For BSAAE president was elected again prof. Radovan Pejanović, and Chief Editor of Journal "Economics of Agriculture", was elected again prof. Drago Cvijanović. For members of the presidency NDAEB were elected unanimously: prof. Radovan Pejanović and prof. Drago Cvijanović, by function. For members of the Presidency were unanimously elected Prof. Milan Milanović, prof. Dragić Živković, prof. Zorica Vasiljević, PhD Grujica Vico, prof. Mile Peševski, prof. Aleksandra Despotović, prof. Victor Manole, prof. Ferhat Ćejvanović, prof. Marko Ivanković, prof. Biljana Veljković and PhD Goran Maksimović. International scientific conference aroused huge interest, which justifies the visit and the active participation of a large number of scientists, experts and guests from home and abroad. Papers that were published after positive review emphasize the significance and timeliness of topics, both in Serbia and other Balkan countries as well as in Europe and the world.